OK - last one for this series. Can anyone put current events together? Yes, "Spamalot" was playing this town last week, awesomely clashing with the tremendous gothic cathedral a couple blocks away. . .
Cologne it is! Which is to say, it was, and is again. 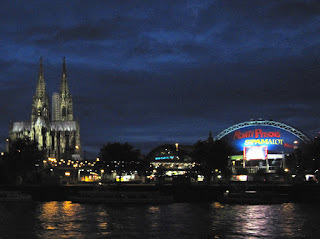 I am in Köln tonight for a meeting tomorrow and was in for three days last week for a conference. In between, I took a side trip to . . . another Quiz destination! Check back soon!